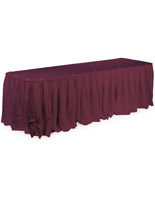 These Table Skirts for Formal Events Make it Easy to Own Rather than Rent! Decorate with Tablecloths, Covers, Throws, and Linens for a Professional Look! Attract Attendees or Customers with the Most Effective Table Skirts! Hook and loop makes setup incredibly easy! 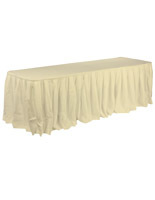 13-1/2-foot polyester cloth can cover round & rectangular tables. Box pleating adds a fullness & style to standard table displays. Table skirts are typically used during formal events, such as business meetings or receptions, to create a more refined and unified presentation. 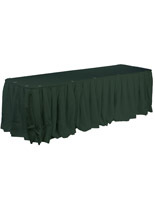 These tablecloths feature a box pleated design that adds fullness and ornamental appeal to any display. The table skirts, also known as linen covers, are 13-1/2 feet long and may be draped around a variety of different-sized tables. Use the throws to wrap the entire perimeter of a 48" diameter surface. The table skirts will also cover three sides of either a 6 or an 8-foot display. 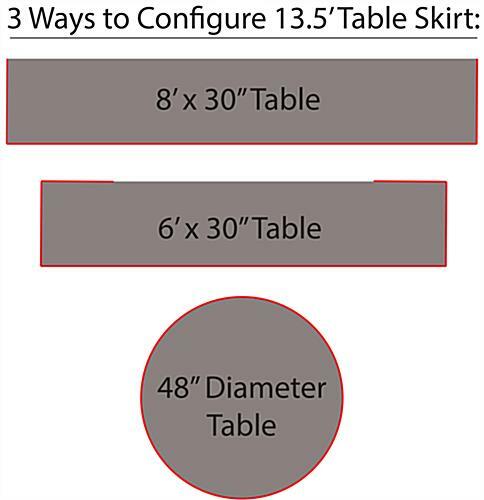 The table skirts are sold without clips and toppers, so users can easily adjust them to accommodate differing sizes of tables. These table skirts are made from 100% polyester fabric and feature a bright, Royal Blue color. 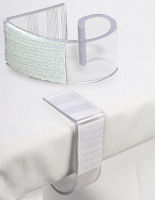 The tablecloths also include hook and loop clad siding, which makes them incredibly easy to attach to a table. 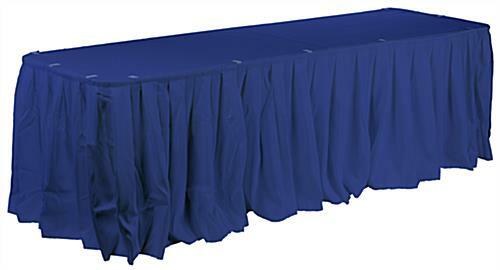 Table skirts, such as covers, are meant for use within reception halls or convention centers to help users create a more cohesive presentation, even when tables differ in size and layout. Buying the throws saves money versus renting, while still resulting in a stylish and professional-looking arrangement!